﻿During the 1930s, a series of short informal histories of the various Middleborough school houses were compiled by J. Stearns Cushing, Superintendent of Middleborough Schools from 1927 until 1955. Mr. Cushing prepared these histories for publication as a series in the Middleboro Gazette beginning on February 24, 1933. With information culled largely from town reports, the series entitled "The History of Our Schools" sought to provide the community with a better understanding of the past history of its public school buildings. The Soule School on Winter Street which served the Soule Neighborhood was perhaps one of the least well known schools in Middleborough, situated as it was in the remote northeastern corner of town. Even Cushing's history gives little information beyond the construction costs. The Soule School was built in 1902 to replace a smaller, earlier structure. On November 12, 1902, the new school was officially dedicated with ceremonies recorded for posterity in the pages of the Brockton Times. "The dedication of the new schoolhouse in the Soule neighborhood took place yesterday afternoon. There was a large attendance. An interesting program consisting of memory gems, recitations by individuals and by the school in concert, as well as songs arranged by the teacher, Miss Carrie E. Soule, was successfully carried out. Altho' the appropriation had been made [for the Soule School] at the same time as that for the Pleasant Street school no bid was received by the Committee which could be carried out and keep within the appropriation. The specifications were revised and a new bid accepted which it was hoped would keep the cost within the limit, and the contract was awarded. The Committee reported that a fence must be built on the line of the lot adjoining Mr. Ward, and that a well should be dug. The school was not re-opened for the 1940-41 school year. 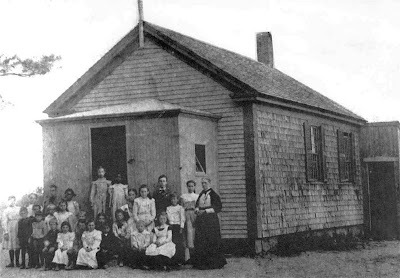 In 1945, the schoolhouse and lot were offered at auction and disposed of by the town. Brockton Times, "Schoolhouse Dedicated", November 13, 1902. Middleborough Annual Town Reports, 1933-40.